No matter how busy your team is, give customers precise, instant answers 24/7 with Answer Bot. Already a customer? Get Answer Bot. 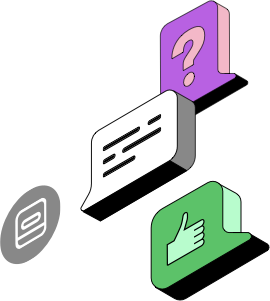 Instantly resolve 29% of your customers’ most common questions with Answer Bot. Wow your customers with a fast, easy support experience every time – even when your team is busy or offline. Precise answers mean customers get exactly what they’re looking for with less effort. 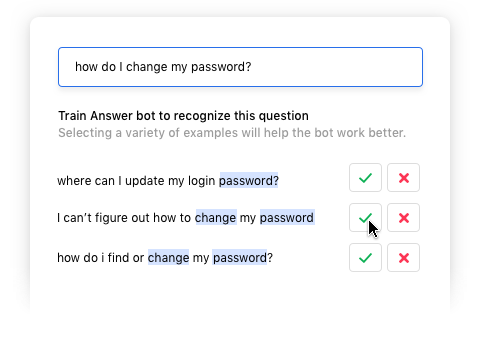 Answer Bot uses machine learning to identify questions it can handle while your team solves the rest. 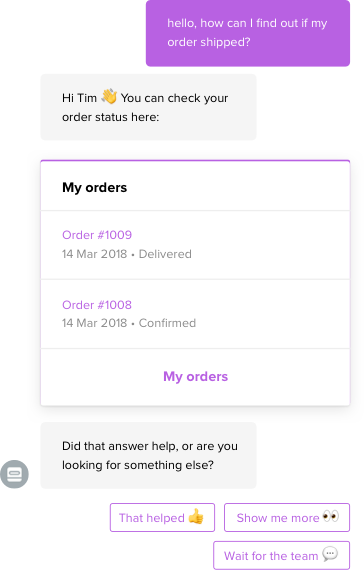 Let customers resolve their own queries with 100+ apps for order updates, incident reports and more. Add the personal touch by including a customer’s name, company name and more in Answer Bot’s reply. Stay in control of your customer experience with intelligent automation that’s easy to customize to match your brand. You tell Answer Bot exactly how to answer, so responses are always consistent and in your brand voice. Let Answer Bot take care of simple questions, while your team handles those that need a human touch. 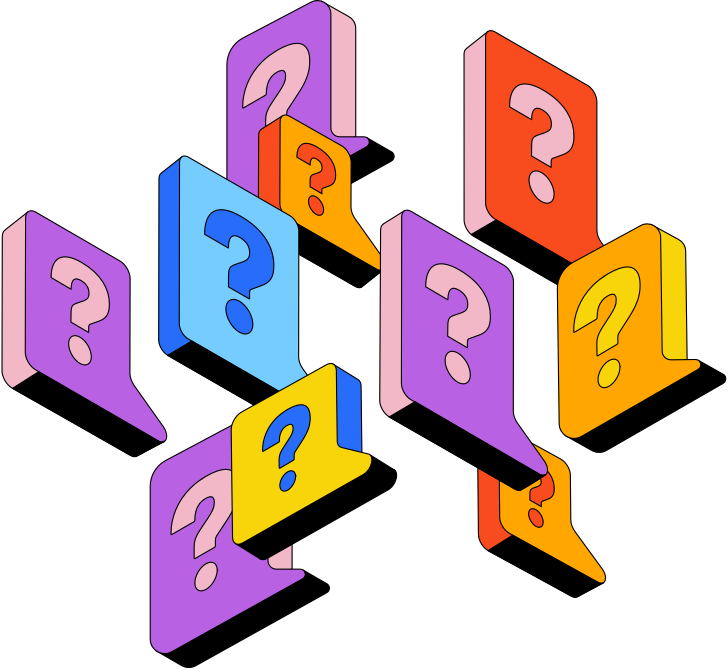 Teach Answer Bot to recognize similar questions using examples from your previous conversations. 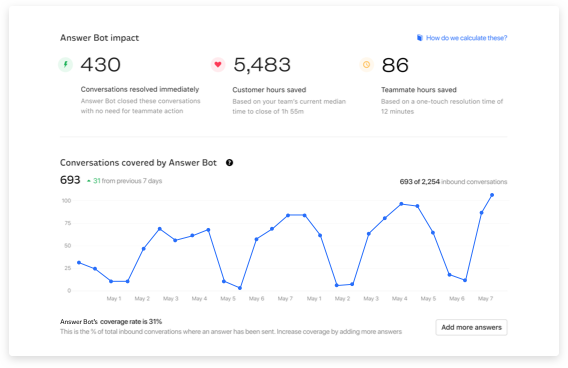 Answer Bot analyzes your conversations in Intercom or Zendesk Chat to suggest answers to automate. Accelerate resolution times and free up your team to focus on building meaningful customer relationships. Know your common questions, find new ones to automate and measure time saved with insightful reports. 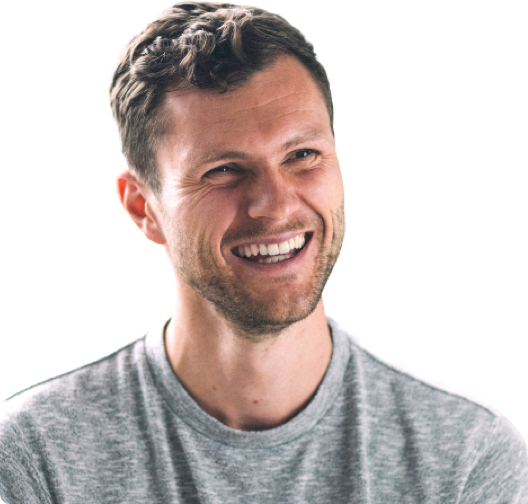 Save your team from answering the same questions over and over, so they can focus on more productive tasks. 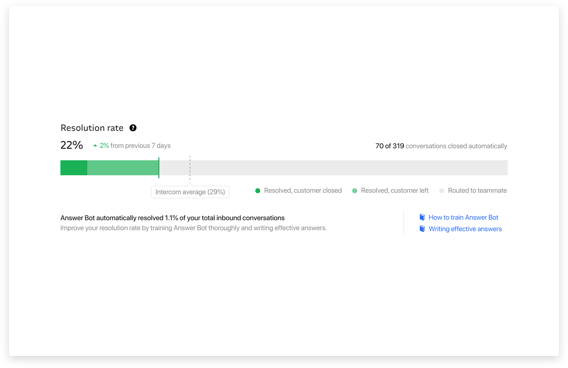 Make your team more efficient by automating simple actions like routing conversations, collecting customer feedback and more. Build your perfect bot for proactive, targeted support triggered by customer behavior, company size and more.